Grace Nickel is an award-winning artist who has been successful in numerous competitions, including the Mino International Ceramics Competition, Japan, the Taiwan Ceramic Biennale, the Cheongju International Craft Biennale in Korea, and the Fletcher Challenge Award in New Zealand. She is a member of the Royal Canadian Academy of Arts and is represented in numerous national and international collections, including the Museum of Modern Ceramic Art in Gifu, Japan. 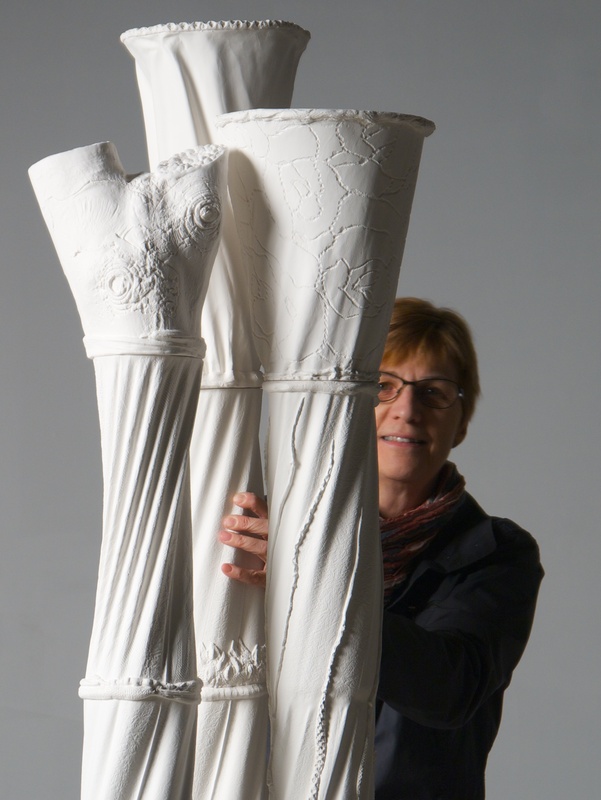 Her work was selected for the NCECA Invitational Exhibition, Earth Matters, in Philadelphia in 2010, and public commissions include Donors’ Forest, which was unveiled at the Beechwood National Cemetery of Canada in Ottawa, also in 2010. She was awarded a Canada Council grant in 2013 in support of a new body of work she created for a solo exhibition at the Canadian Clay and Glass Gallery, Arbor Vitae, which took place in Winter 2015. Grace currently sits on the board of the Manitoba Craft Council and has a long history of involvement with the arts community and teaching art. She is currently an Assistant Professor in the School of Art at the University of Manitoba. Grace Nickel and her husband Michael Zajac, photographer, digital technician, and designer, often work collaboratively on projects. Master of Fine Arts, 2008, NSCAD University, Halifax, Nova Scotia. Museology Studies, 1981, University of Winnipeg, Manitoba. Bachelor of Fine Arts (ceramics major), 1980, University of Manitoba, Winnipeg, Manitoba. Assistant Professor, School of Art, University of Manitoba, Winnipeg, 2010 to present. Instructor (full-time), School of Art, University of Manitoba, Winnipeg, 2009–10. Sessional Instructor, Ceramics Area, School of Art, University of Manitoba, Winnipeg, 2002–06, 2008 (fall semester). Mentor, Foundation Advisory Program, MAWA (Mentoring Artists for Women’s Art) – working with two emerging women artists for one-year periods of mentorship, 2004–2005, 1999–2000, 1991–92. Instructor, adult classes in paper clay and ceramic tile, Studio Programs, Winnipeg Art Gallery, 1997–99. Instructor, adult and children’s classes in drawing, mixed media, and clay, Studio Programs, Winnipeg Art Gallery, 1978–86. Head Teacher and Co-ordinator, Saturday Morning Art Classes (for children and youth from the inner-city schools of Winnipeg), program of Winnipeg School Division No. 1, 1982–86. Instructor, Saturday Morning Art Classes, Winnipeg School Division No. 1, 1978–82. Instructor, adult ceramics classes, City of Winnipeg Parks and Recreation Department, 1980–84. New Acquisition: Devastatus Rememorari (upcoming, 2015), Art Gallery of Nova Scotia, Halifax. Work donated by the artist to the AGNS for its permanent collection in 2013. Arbor Vitae (2015), Canadian Clay and Glass Gallery, Waterloo, Ontario, curator Christian Bernard-Singer, catalogue in progress. One of four concurrent solo exhibitions collectively called Exquisite Woods. Grace Nickel: Gallery in the Park (2009), Altona, Manitoba, curator Odia Reimer, catalogue. Devastatus Rememorari (2008), Mary E. Black Gallery, Halifax, Nova Scotia, publication with guest writer Dr. Sandra Alfoldy. A Quiet Passage: Grace Nickel (2002), Winnipeg Art Gallery, Manitoba, curator Helen Delacretaz, Chief Curator at the Winnipeg Art Gallery, catalogue. Overlay (1987), Ace Art, Winnipeg, Manitoba. Northern Lights/Southern Exposure (2009), Perth Galleries, Perth, Australia, curator Sandra Black, catalogue. Recent Work (1989), Galerie Barbara Silverberg Contemporary Ceramics, Montréal, Québec, curator Barbara Silverberg. Manitoba Artists in Japan (1989), Manitoba Craft Council Gallery, Winnipeg. Manitoba Ceramic Artists (1985), Hughes Fine Arts Gallery, Grand Forks, N.D.
Grace Nickel and Patrick Mahon (1984), Ace Art, Winnipeg, Manitoba. Earth Matters (2010), NCECA Invitational Exhibition, Levy Gallery, Galleries at Moore College of Art and Design, Philadelphia, PA, curator Linda Ganstrom, catalogue. Unity and Diversity (2009), Cheongju International Craft Biennale, Korea, curator for Canada (guest country) Sandra Alfoldy, catalogue. Inaugural Exhibition (2007), Canadian Ceramic Museum, Fuping, China – FLICAM (Fule International Ceramic Art Museums) international residency project at the Fuping Pottery Art Village, Shaanxi, China. Taipei County Yingge Ceramics Museum, Yingge, Taiwan. Ceramic Lantern Exhibition (2003), Taipei County Yingge Ceramics Museum, Taiwan, in conjunction with the Museum’s Annual Ceramic Festival. Manitoba Crafts Council Gallery, Winnipeg, Manitoba. Delegates Exhibition: Diverse (1999), Western Australian School of Art, Design and Media Gallery, Perth, Australia, catalogue. Edge to Edge: Ceramics from Australia and Canada (1999), Perth Galleries, Perth, Australia. Remotely Inspired (1997), Pottery Workshop and Showroom, Hong Kong, facilitated by the Manitoba Crafts Council, curator and coordinator Trudy Golley. Wyman Building, Minneapolis, Minnesota, in conjunction with the NCECA Conference. St. Norbert Arts and Cultural Centre, Winnipeg, Manitoba. Hong Kong Visual Arts Centre Exhibition Hall. Koffler Gallery, North York, Ontario. International Invitational Exhibition of Ceramic Art (1992), National Museum of History, Taipei, Taiwan, catalogue, work acquired for permanent collection. Fletcher Challenge Ceramics Award (1992), Auckland Museum, Auckland, New Zealand, catalogue, selected works acquired by the Province of Manitoba. The Second International Ceramics Competition ’89 Mino, Japan (1989), Special Exhibition Hall, Tajimi City, Japan, catalogue, Bronze Award, work acquired by the Museum of Modern Ceramic Art, Gifu, Japan. Actually (2015), Actual Gallery, Winnipeg, Manitoba, members’ exhibition, curator Alex Keim. Arm’s Length: The Northwest Arm and the Artist (2015), Art Gallery of Nova Scotia, Halifax, curators Dianne O’Neill and Laurie Hamilton, folder. Frost-bitten Mosquito-slapping Trolley-tippers: Contemporary Art from Manitoba (2014), The General Fine Craft, Art and Design, Almonte, Ontario, curators Diana Thorneycroft and Michael Boss. 1000 Miles Apart Faculty and Student Exhibition (2014), Red Deer College, Alberta. The WAG Century: celebrating the Winnipeg Art Gallery’s 100th anniversary (2013), Winnipeg Art Gallery. Dirty, Dirty, Dirty, Dirty (2013), Alberta College of Art and Design, Calgary, Alberta, student and faculty exhibition in conjunction with the 1000 Miles Apart Ceramic Conference. Glen P. Sutherland Gallery, Brandon University, Brandon, Manitoba. Matter of Clay III (2011), Jonathon Bancroft-Snell Gallery, London, Ontario, curator Jonathon Bancroft-Snell, catalogue. Art Gallery of Regina, Saskatchewan. Chapel Gallery, North Battleford, Saskatchewan. Red Deer Museum and Art Gallery, Red Deer, Alberta. Sam Waller Museum, The Pas, Manitoba. Moose Jaw Museum & Art Gallery, Moose Jaw, Saskatchewan. Gallery 1C03, University of Winnipeg, Manitoba. Affinity Gallery, Saskatchewan Craft Council, Saskatoon, Saskatchewan. Alberta Craft Gallery, Edmonton, Alberta. West Meets East (2010), Harbinger Gallery, Waterloo, Ontario, curator Ann Roberts, folder. Subconscious City (2008), Winnipeg Art Gallery, Winnipeg, Manitoba, curators Shawna Dempsey and Lorri Millan, catalogue. RCA Exhibition (2007), Mayberry Fine Arts Gallery, Winnipeg, Manitoba. Matter of Clay II (2006), Jonathon Bancroft-Snell Gallery, London, Ontario. In the Margins: Canadian Women Working In Clay (2005), Mary E. Black Gallery, Nova Scotia Centre for Craft and Design, Halifax, Nova Scotia, curator Alexandra McCurdy. Branching Out (2005), Manitoba Craft Council Gallery, Winnipeg, Manitoba. Tenth Anniversary Exhibition (2005), Site Gallery, Winnipeg, Manitoba. Robert Archambeau: Artist, Teacher, Collector (2004), Winnipeg Art Gallery, Winnipeg, Manitoba, curator Helen Delacretaz, catalogue. Genius Loci (2003), Canadian Clay and Glass Gallery, Waterloo, Ontario, curator Glen Allison, CD catalogue. Clay at the Crossroads (2000), Winnipeg Art Gallery, Winnipeg, Manitoba, curator Helen Delacretaz. A Treasury of Canadian Craft (1992), Canadian Craft Museum, Vancouver, B.C., curator Sam Uhlick, catalogue. Rooms to Let (1992), St. Norbert Arts and Cultural Centre, Winnipeg, Manitoba, curators Wayne Baerwaldt and Patti Johnson, catalogue. Fourth National Biennial of Ceramics (1990), Manoir de Tonnancour, Trois-Rivières, Quebec, catalogue. Ten Artists: Ten Provinces (1989), Harbourfront Festival of Craft and Design Tenth Anniversary Exhibition, York Quay Gallery, Toronto, Ontario. Donors’ Forest (2010), Beechwood National Cemetery of Canada, Memorial Centre entrance, Ottawa, Ontario. Tile Triptych (2009), gift for a University of Manitoba donor from President Dr. David Barnard. Private commissions (1996–2006), Winnipeg, Manitoba, and Lake of the Woods, Ontario. Nominated for Saidye Bronfman Award (Manitoba Craft Council), 2014. Winnipeg Arts Council Grant to Individuals, 2014, 2005, 1999, 1994. Canada Council Crafts Grant to Individuals, 2013, 2001. University of Manitoba Creative Works Grant, 2012, 2009, 2008. Nominated for membership in the International Academy of Ceramics, 2011. Canada Council Travel Grant, 2010, 2007, 1999. Manitoba Arts Council Individual Craft Grant, 2008, 1987–2007 (nine). Inducted into the Royal Canadian Academy of Arts, 2007. NSCAD University MFA Scholarship, 2007, 2006. Manitoba Arts Council Major Arts Award, 2005. Manitoba Arts Council Short Term Project Grant, 1998–2004 (ten). Winnipeg Arts Council Professional Development Grant, 2003. Crafts Guild of Manitoba Bursary, 2003, 1990. Nominated for Saidye Bronfman Award (Winnipeg Art Gallery), 2002. Manitoba Culture, Heritage and Citizenship Travel Grant, 1999, 1989. Banff Centre Scholarship, 1996, 1991, 1985. Manitoba Arts Council Visual Arts Grant A, 1994. Manitoba Arts Council ArtVentures Grant, 1992. Plainsman Clay Scholarship, I. XL Industries Ltd., 1991. Canada Council Visual Arts Grant B, 1990. University of Manitoba Isbister Undergraduate Scholarship in Fine Arts for Highest Standing, 1979. Art Gallery of Nova Scotia, Halifax, Nova Scotia (certified by Canadian Cultural Property Export Review Board, 2010). Cambrian Credit Union, Winnipeg Manitoba. Canadian Ceramics Museum, Fuping, China. Claridge Collection, Montréal, Québec (1989 to 2015, when the collection was de-accessioned). Manitoba Arts Council Visual Art Bank. Manitoba Blue Cross, Winnipeg, Manitoba. Manitoba Legislative Building, Province of Manitoba. Manitoba Hydro Building, Winnipeg, Manitoba. Museum of Modern Ceramic Art, Gifu, Tajimi City, Japan. National Museum of History, Taipei, Taiwan. New Taipei City Yingge Ceramics Museum, Taiwan. Tainan National University of the Arts, Tainan County, Taiwan. Private collections in Canada, the United States, Australia, Europe, Taiwan, China. Shaw International Residency, Medalta, Medicine Hat, Alberta, 2015 (upcoming). Pottery Workshop, Jingdezhen, China, 2014. To continue exploring large-scale, porcelain tile-making capabilities in Jingdezhen and further investigate the potential of non-orthogonal imagery for decals on large tiles, pursue fabric-formed models at a large scale, using the translucency of the Jingdezhen porcelain, continue investigations into metallic PVD (physical vapour deposition) process, working in China with student Grace Boyd who won an Undergraduate Research Award (University of Manitoba research mentorship program whereby the student chooses a professor to work with for the summer). Pottery Workshop, Jingdezhen, China, 2012. Researched PVD process, fabric-formed model-making with special fabrics, mould-making, slip-casting, super white, translucent porcelain, large-scale tiles, and custom-made decals for tile imagery, attended master workshops in Qing Hua (blue and white painting) on porcelain and traditional carving, toured masters’ studios and porcelain factories. Research work at AssentWorks public fabrication workshop and makerspace, Winnipeg, Manitoba, 2012. Explored vacuum forming, 3-D scanner, 3-D printing and applied these new methods to my porcelain tree-forms and light sconces. Research work at CAST (Centre for Architectural Structures and Technology), the University of Manitoba, Winnipeg, Manitoba, 2012. Investigated fabric-formed model and mould-making techniques. Fremantle, Western Australia, 2009. Invited to work with ceramic artist Sandra Black in her studio in Fremantle to create work for a collaborative exhibition, “Northern Lights/Southern Exposure,” at Perth Galleries in Perth, Australia. University of Manitoba, Ceramics Department, Winnipeg, MB, 2008. Invited Artist In Residence in conjunction with the Summer Ceramic Residency Program. FLICAM (Fule International Ceramic Art Museums) project, Fuping, China , 2007. Ten Canadian artists were selected by Les Manning to create the charter collection for the new Canadian Ceramic Museum, which was being built as the artists completed new works in the international studio attached to the Fule tile factory on site (in this privately funded venture, a ceramic museum is being built to represent each country), attended the inaugural opening of the new Canadian Ceramic Museum, Fuping Pottery Art Village, attended ICMEA (International Ceramic Magazine Editors Association) Symposium 2007. Research Assistant, NSCAD University, Halifax, NS, “Sustainable and ecology-based uses of ceramic as a bio-related substrate” (working with Professor Neil Forrest). International Large Outdoor Ceramic Lantern Workshop, Tainan National University, sponsored by New Taipei City Yingge Ceramics Museum, Taiwan, 2003. – an international residency program where participants were invited to create a two-meter tall ceramic light sconce in a one-month period for exhibition during the Annual Ceramic Festival (then placed in the museum’s permanent collection). University of Manitoba, Ceramics Department, Winnipeg, MB, 2001. Invited Artist In Residence in conjunction with the Summer Ceramic Residency Program. Invited Adjunct Research Fellow, Curtin University of Technology, Ceramics and Glass Department, School of Art, Perth, Western Australia, 1999 – researched new ceramic light sconce forms and alternative methods for light emission, including slumped glass and clay filigree. Architectural Ceramics Workshop with Nino Caruso, Western Australian School of Art, Design and Media, Perth, Western Australia, 1999. The Banff Centre For The Arts, Banff, Alberta, New Works Residency, Media & Visual Arts, , 1996. Worked on light sconce commission. University of Manitoba, Winnipeg, MB: participant in Summer Ceramic Residency Program, 1996. Worked on light sconce commission. The Banff Centre For The Arts, Banff, Alberta: Ceramic Residency Program, 1991 – researched paper clay. The Banff Centre For The Arts, Banff, Alberta: Ceramic Residency Program, 1985 – researched large-scale vessel-making and new mould-making methods. Rosette Gault, Paperclay: Art and Practice, London: Bloomsbury Press and Philadelphia: University of Pennsylvania Press, 2013, p 134; first published by Craftsman House, 1997, pp 44, 66. Stephen Borys, ed., Winnipeg Art Gallery: Guide to the Collections, Winnipeg Art Gallery, 2010, p 212. Anderson Turner, ed., Ceramic Art: Innovative Techniques, Ceramic Arts Handbook Series, American Ceramic Society, 2000, pp 47–52. Janet Mansfield, Ceramics in the Environment, An International Review, London: A&C Black and Ohio: American Ceramic Society, 2005, pp 58–60. Gail Crawford, Studio Ceramics in Canada, 1920 to 2005, Goose Lane Editions with the Gardiner Museum of Ceramic Art, 2005, pp 161, 170. Robin Hopper, Making Marks: Discovering the Ceramic Surface, KP books, 2004, p 123. Robin Hopper, The Ceramic Spectrum, 2nd ed., 2001, p 229. Focus One: Contemporary Studio Ceramics, Collection of the Winnipeg Art Gallery, Winnipeg Art Gallery, 1997. Franklin Silverstone, Claridge Collection: Gift for Charles Bronfman, Montréal: Claridge, 1991. Arbor Vitae, Waterloo, Ontario: Canadian Clay and Glass Gallery, 2015 (in progress). Essay by Sigrid Dahle, forward by Sheila McMath. Distributary, Winnipeg: Manitoba Craft Council and Ace Art, 2012. Essay by Chris Pancoe. Matter of Clay III, Jonathon Bancroft-Snell Gallery, 2011. Essays Jonathon Bancroft-Snell (intro) and Helen Delacretaz (forward). Prairie Excellence, Alberta Craft Council and Saskatchewan Craft Council, and the Manitoba Craft Council, 2010. Earth Matters, National Council On Education For The Ceramic Arts, 2010. Essays byNicole Burisch and Glen R. Brown. Unity and Diversity, Cheongju International Craft Biennale, Korea, 2009. Essay by Sandra Alfoldy. Northern Lights/Southern Exposure, Perth Galleries, Perth, Australia, 2009. Essay by David Walker. Grace Nickel and William Pura (web catalogue), Gallery One One One, University of Manitoba, 2009. Essay by Cliff Eyland. Grace Nickel, Gallery in the Park, Altona, Manitoba, 2009. Subconscious City, Winnipeg Art Gallery, Winnipeg, Manitoba, 2008. Essays by Sigrid Dahle, Guy Maddin, Molly Johnson and Richard Milgrom, Marvin Frances, John K. Sampson, Claudine Majzels, Jeanne Randolph, and Shawna Dempsey and Lorri Millan. Robert Archambeau: Artist, Teacher, Collector, Winnipeg Art Gallery, Winnipeg, Manitoba, 2004. Essay by Helen Delacretaz. The First Taiwan Ceramic Biennale 2004, New Taipei City Yingge Ceramics Museum, Taiwan, 2004. The Power of Design and Art: The International Ceramics Festival Mino, Japan: A Retrospective 1986–2002, Seiichi Watanabe and Mieko Iwai eds., Museum of Modern Ceramic Art, Gifu, Japan, 2003. Grace Nickel: A Quiet Passage, Winnipeg Art Gallery, Winnipeg, Manitoba, 2002. Essay by Helen Delacretaz. The Sixth Taiwan Golden Ceramics Awards, New Taipei City Yingge Ceramics Museum, Taiwan, 2000. Diverse: 9th National Ceramics Conference Delegates Exhibition, The Western Australian School of Art, Design & Media Gallery, Perth, Australia, 1999. Ground/Connection, Mentoring Artists for Women’s Art, Winnipeg Manitoba, 1995. Essay by Amy Gogarty. Clay in Canada: North by Northwest, Manitoba Craft Council, Winnipeg, Manitoba, 1993. Selected Treasures, Taipei Fine Arts Museum, Taipei, Taiwan, 1993. Taipei International Exhibition of Traditional Arts and Crafts 1993, Taipei Fine Arts Museum, Taipei, Taiwan, 1993. Rooms to Let, St. Norbert Arts and Cultural Centre Fall Festival, St. Norbert, Manitoba, 1992. A Treasury of Canadian Craft, Canadian Craft Museum, Vancouver, B.C., 1992. Claridge Collection (Gift for Charles Bronfman), Claridge, Montréal, 1991. Fourth National Biennial of Ceramics, Trois-Rivières, Québec, 1990. Mennonite Artist: Insider as Outsider, Manitoba Mennonite Historical Society, Winnipeg, Manitoba, 1990. Essay by Priscilla Reimer. 2nd International Ceramics Competition ’89, International Ceramics Festival, Mino, Japan, 1989. In Praise of Crafts, Winnipeg Art Gallery, Winnipeg, Manitoba, 1988. 1987: Contemporary Art in Manitoba, Winnipeg Art Gallery, Winnipeg, Manitoba, 1987. Reflections on Three Plains, Winnipeg Art Gallery, Winnipeg, Manitoba, 1984. Arm’s Length: the Northwest Arm and the Artist, Art Gallery of Nova Scotia, Halifax, N.S., 2015. Essay by Michèle H. Raymond. West Meets East, Harbinger Gallery, Waterloo, Ontario, 2010. Essay by Ann Roberts. Devastatus Rememorari, Mary E. Black Gallery, Halifax, N.S., 2008. Essay by Sandra Alfoldy. In the Margins: Canadian Women Working in Clay, Mary E. Black Gallery, Nova Scotia Centre for Craft and Design, Halifax, NS 2005. Essay by Alexandra McCurdy. Judy Donaldson, “Exquisite Woods,” in Fusion Magazine (Clay and Glass), v 39, n 2, Spring/Summer 2015, pp 14–19. Sarah Swan, “Breaking Barriers, Western Artists Push the Boundaries of Clay,” in Galleries West, v 14, n 2, summer 2015, pp 42–45. Portfolio: “Feminine/Masculine/Feminine: Grace Nickel, Clint Neufeld, and Gathie Falk,” in Rhubarb: A Magazine of New Mennonite Art and Writing, Winnipeg, n 32, spring 2013, pp 29–34. Mary Reid, “Prairie Excellence,” in Craft Journal, v 5, n 2 (spring), October 23, 2013. Glen R. Brown, “Earth Matters,” Ceramics Art and Perception International, v 20, n 4, 2011, pp 86–88. Mary Ann Steggles, “The Dancing Ash,” Ornamentvm, spring/summer 2011, pp 13–15. Tiana Roebuck, “Slice (servings of hot happenings in craft): Grace Nickel’s Donors’ Forest,” Studio: Craft and Design in Canada, spring/summer 2011, p 5. “Upfront Exhibitions: Northern Lights/Southern Exposure,” in Ceramics Monthly, February 2010. Stacey Abramson, “Grace Nickel, Devastatus Rememorari,” in Galleries West, spring 2010. pp 34, 36. Sandra Black, “Getting Some Distance: Sandra Black on her Canadian Residencies,” in The Journal of Australian Ceramics, v 48, n 1 (April 2009), pp 70–73. Kristen den Hartog, “Canadians in China: Kristen den Hartog writes on the Canadian experience in Fuping,” in Ceramics Technical (Australia), n 27, 2008, pp 83-88. Glen R. Brown, “Fire and Light: Grace Nickel’s Metaphorical Lamps,” in Ceramics Monthly, January 2007, pp 40–43, cover. Les Manning and I Chi Hsu, “2007 Canada Museum Opening,” in Chinese Potters Newsletter Quarterly (FLICAM Official Museum Newsletter), nn 36–37, autumn and winter 2007, pp 20–25. Mei-Yueh Hsu, “Grace Nickel,” in ArTop, n 25, Tainan University of the Arts, Taiwan, 2005, pp 85–88. Anne Coroneos, “A Ceramic Festival in Taiwan,” in Ceramics Technical (Australia), n 19, 2004, pp 65–70. Helen Delacretaz, “A Quiet Passage,” in Ceramics: Art and Perception (Australia), n 52, 2003, pp 87–90. “Upfront: Grace Nickel,” in Ceramics Monthly, October 2002, p 16. Gordon Filewych, “The Back Page: Forms of Growth,” in Canadian Architect, May 2002, p 62. “Grace Nickel: Sanctuary,” in Rhubarb, Silence Issue, n 8, Winter 2002, pp 22–27. Marnie Butvin, “Grace Nickel: A Quiet Passage,” in Tableau: A Publication of the Winnipeg Art Gallery, v 2002–2, March/April 2002, p 6, cover. Heather Mousseau, “Nickel Strive(s) To Create Beautiful Things,” in Tableau: A Publication of the Winnipeg Art Gallery,v 2002–2, March/April 2002. “A Quiet Passage,” in Border Crossings, v 21, n 82, May 2002, back cover. Murray Gibbs, “Demonstrators at the 1999 National Ceramics Conference,” Pottery in Australia, v 38, n 1, March 1999, pp 40–42. Trudy Ellen Golley, “Full Circle: The Story of a Commission,” in Contact Magazine: Ceramics From A Canadian Perspective, n 111, winter 1997/98, pp 32–35. Amy Gogarty, “Ground/Connection,” in Ceramics: Art and Perception, (Australia), n 26, 1997, pp 46–52. “Ground/Connection,” in Contact Magazine: Ceramics from a Canadian Perspective, n 105, summer 1996, pp 12–15. Amy Gogarty, “Ground/Connection,” in NCECA 1995 Journal – Borderline Clay, v 16, 1995, pp 103–105. “Fletcher Challenge: Takomori’s Choice,” in Ceramics Monthly, May 1993, p 45. “National Biennial of Ceramics, Québec,” in Ceramics: Art and Perception, (Australia), n 2, 1990, p 83. “Profile: Grace Nickel,” in Contact Magazine: A Publication of the Alberta Potters’ Association, n 83, winter 1990, pp 4–6, cover. “Grace Nickel: Award at Mino,” in Fusion Magazine: A Publication of Fusion: The Ontario Clay and Glass Association, v 14, n 4, autumn 1990, p 13, cover. “Nickel Wins Award in Ceramic Olympics,” in Tableau: A Publication of the Winnipeg Art Gallery, v 3, n 1, January–February 1990, p 7. “Canadians Receive Honours: 2nd International Ceramics Competition ’89 Mino, Japan,” in Contact Magazine: A Publication of the Alberta Potters’ Association, n 79, winter 1989, pp 9–11. Robert Reid, “Exquisite Woods exhibition examines ecological concerns,” in TheRecord.com, January 26, 2015, (last accessed June 2, 2015). Steven Leyden Cochrane, “Like clay in the hands of the potter,” in Uptown, August 23, 2012, p 11. Alison Gillmor, “Manitoba Craft Council presents eye-catching ceramics in ‘Distributary’,” CBC Manitoba Scene (online), August 3, 2012. Alison Gillmor, “Traditional crafts explore complex questions,” in Winnipeg Free Press, May 5, 2011, p D3. Stacey Abramson, “Artists explore ideas of change, memory,” review of Grace Nickel and William Pura at Gallery One One One, University of Manitoba, in Winnipeg Free Press, August 27, 2009, p D5. Sarah Petz, “(Re)Manufactured Landscapes: Local artists see devastation as a starting point for creation,” review of Grace Nickel and William Pura at Gallery One One One, University of Manitoba, in The Manitoban, v 97, n 4, September 9, 2009, p 24. Lori Penner “When nature and culture collide,” review of Grace Nickel at Gallery in the Park, in The Red River Valley Echo, Friday, April 24, 2009, p 14. Elissa Barnard, “Seeing the forest for the trees: Nickel’s elegy of ceramics, salt, text, reflects on ruin of Juan, reconstruction,” review of Devastatus Rememorari at the Mary E. Black Gallery, Halifax, in The Chronicle Herald, May 22, 2008, p E6. Dean Lisk, “Remembering destruction,” review of Devastatus Rememorari at the Mary E. Black Gallery, Halifax, in Metro Halifax, April 25–27, 2008, p 22. Amy Karlinsky, “In Site, Recent Work By New Faculty At The School of Art,” (review) in Winnipeg Free Press, January 16, 2003. Scott Barham, “Clay renaissance captured,” review of Clay at the Crossroads in Winnipeg Free Press, December 18, 1999, p B9. Garth Buchholz, “Ceramic artists join mentors in exhibit,” review of Ground/Connection in Winnipeg Free Press, January 6, 1996, p B4. Allison Gillmor, “The First Decade Show: Ace Art,” review in Winnipeg Free Press, September 11, 1993, p B5. Terry Weber, “Mentors help emerging artists,” preview of Myriad, Mentoring Artists for Women’s Art Advisory Program exhibition, in Winnipeg Free Press, January 12, 1993, p B8. “Rooms To Let: Decorated/Undecorated,” in Winnipeg Free Press, September 5, 1992, p B4. “Marriage of Minds: Second Edition,” in Winnipeg Free Press, August 1, 1992, p B22. “Contemporary Studio Collections in Ceramics, Glass and Silver,” in Winnipeg Free Press, May 9, 1992, p C28. “Mennonite Artist: Insider as Outsider,” in Winnipeg Free Press, July 21, 1990, p 30. Randal McIlroy, “Manitoba Artists Honored In Japan,” in Winnipeg Free Press, November 25, 1989, p 32. Randal McIlroy, “Overlay,” review in Winnipeg Free Press, December 19, 1987, p 20. Liana Voia, “Video interview, Arbor Vitae: Grace Nickel (w/ Michael Zajac) at the Canadian Clay and Glass Gallery, January 2015,” (last accessed June 2, 2015). Sean Moore, “World-Class Ceramics Conference Will Cultivate Creativity in City and on Campus,” in Newsroom, University of Manitoba website, Sept. 28, 2011. David Rice Jewelry & Objects. “Grace Nickel,” in Rhubarb Magazine. Grace Nickel, “A Conversation on Making and Teaching in a Post-disciplinary Time,” in “The Question of Material and Labour,” special issue, Cahiers métiers d’art/Craft Journal, winter 2015, v 7, n 2. Guest Co-editor with Mireille Perron from Alberta College of Art and Design, “The Question of Material and Labour,” special issue, Cahiers métiers d’art/Craft Journal, winter 2015, v 7, n 2. Grace Nickel, “Northern Lights Southern Exposure,” illustrated article in ResearchLIFE Magazine, University of Manitoba, 2009, pp 29–31. Grace Nickel, Review of Crafting New Traditions: Canadian Innovators and Influences, by Melanie Egan, Allan C. Elder, and Jean Johnson eds., Canadian Museum of Civilization, 2008, in Museum Anthropology Review, v 4, n 2, 2010, Bloomington: Indiana University. “Grace Nickel: A Quiet Passage”, Edith Cowan University, Perth, Australia Artist lecture, Ceramics Arts Association of Western Australia, 2009. Artist presentation, FLICAM (Fule International Ceramic Art Museums) Project, Fuping Pottery Art Village, Fuping, China, 2007. “Echoes of Nature,” Taipei County Yingge Ceramics Museum, Yingge, Taiwan, in conjunction with the First Taiwan Ceramic Biennale, 2004. Artist lecture, Tainan National University of the Arts, Tainan County, Taiwan, 2003. “Manitoba Ceramics: From the Centre of the Continent,” and hands-on demonstrations, Edge: Ninth National Ceramics Conference, Perth, Australia, 1999. Panel member, “Presentation on Mentoring Artists for Women’s Art,” NCECA, Minneapolis, MN., 1995. Lecture on Arbor Vitae for Ottawa Guild of Potters, Ottawa, ON, 2015. Research presentation, AssentWorks public fabrication workshop and makerspace, Winnipeg, MB, organized by the Manitoba Craft Council, 2014. Artist Lecture, School of Art, University of Manitoba, Winnipeg, MB, 2013. Artist lecture, in conjunction with Distributary, Ace Art Gallery, Winnipeg, MB, 2012. “Influence of Place” (in conjunction with the Prairie Excellence exhibition), University of Winnipeg, 2011. Prairie Excellence Panel, University of Winnipeg (Helen Delacretaz moderator), 2011. Artist presentation, 10 x 20 x 20, Winnipeg Art Gallery, Winnipeg, Manitoba, hosted by The University of Manitoba Association of Architecture Students (UMAAS) and the Manitoba Association of Architects (MAA) Interns in Architecture Committee, 2011. Artist presentation, Mary Ann Steggles’ Women in Pottery Seminar, School of Art, University of Manitoba, February 2011. Artist presentation, Gallery One One One, School of Art Gallery, University of Manitoba (in conjunction with the exhibition Grace Nickel & William Pura), 2009. “Made in Taiwan,” Ace Art, Winnipeg, MB, 2004. Artist talk on Taiwan International Ceramic Lantern residency, at The Annex, Winnipeg, MB, 2004, sponsored by MAWA (Mentoring Artists for Women’s Art). Artist lecture, School of Art, University of Manitoba, Winnipeg, Manitoba, 2002. Public tours, A Quiet Passage exhibition, Winnipeg Art Gallery, Winnipeg, MB, 2002. Artist lecture, The Banff Centre, New Works Residency, Banff, AB, 1996. “The Banff Experience,” Manitoba Crafts Council, Winnipeg, MB, 1991. “Grace Nickel Ceramics,” Winnipeg Art Gallery, Winnipeg, MB, 1990. “Manitoba Ceramic Artists,” with Kathy Koop, Hughes Fine Arts Gallery, Grand Forks, ND, 1985. Metchosin International Summer School of the Arts, Victoria, B.C. : “Architectural Ceramics Workshop,” 2008. Tainan National University of the Arts: “Large Ceramic Lantern Workshop” (in conjunction with the seventh-anniversary celebrations of the Tainan National University of the Arts, Taiwan), 2003. Saskatoon Potters’ Guild, Saskatoon, SK: “Paper Clay Workshop,” 2002. The Ontario Clay And Glass Association’s Fusion Conference at Sheridan College, Oakville, ON: “Paper Clay and Light Sconce Workshop,” 2002. Red Deer College, Red Deer, AB, Series: “Sculptural Light Sconce Workshop,” 2001. Haliburton School of Fine Arts, Haliburton, ON: “Paper Clay Workshop,” 1998. Kingston Potters’ Guild, Kingston, Ontario: “Paper Clay Workshop,” 1997. College of Fine Arts, University of North Dakota, Grand Forks, ND, 1985. Ongoing exhibition series “Case Studies”, curated and installed three solo and two group exhibitions, Ceramics and Sculpture Building, University of Manitoba (Tom Rohr, Monica Martinez, Robin DuPont, School of Art Ceramics Faculty, MFA Research in Ceramics), 2013. Co-curator and coordinator, Ground/Connection (group exhibition), facilitated by Mentoring Artists for Women’s Art: exhibited at Wyman Building, Minneapolis, MN (in conjunction with NCECA) and St. Norbert Arts and Cultural Centre, Winnipeg, MB, 1995. 1000 Miles Apart 2013, ACAD (Alberta College of Art and Design), Calgary, Alta. Independence NCECA (National Council on Education for the Ceramic Arts) 2010 Conference, Philadelphia, PA.
Workshop in New Masonry & Ceramic Technologies, CAST (Centre for Architectural Structures and Technology), University of Manitoba, Winnipeg, Man. (organized by Canadian Design Research Network and Canadian Masonry Research Institute), 2008. NeoCraft: An International Conference on the Crafts and Modernity, NSCAD University, Halifax, N.S., 2007. Explorations and Navigations: The Resonance of Place, NCECA 2006, Portland, OR. INvestigations, INspirations: The Alchemy of Art and Science, NCECA 2004, Indianapolis, IN. Borders In Flux, NCECA 2003, San Diego, CA. Ceramic Modernism, Gardiner Museum of Ceramic Art, Toronto, Ont., 2002. 1000 Miles Apart 2002, Red Deer College, Red Deer, Alta. Borderline Clay, NCECA 1995, Minneapolis, MN. Gumbo Ceramique, NCECA 1994, New Orleans, LA. International Ceramics ’93, Alberta College of Art, Calgary, Alta., 1993. Pacific Rim, NCECA 1993, San Diego, CA. Old Worlds/New Worlds, NCECA 1992, Philadelphia, PA.
Research Assistant to Conference Convenor Sandra Alfoldy, NeoCraft International Conference on Modernity and the Crafts, NSCAD University, Halifax, N.S., 2007. Grants Manager: Grant writing for Art City (a community art studio in Winnipeg’s inner city where professional artists conduct collaborative workshops) Winnipeg, Man., 2000–2008. Arts Administration Consultant, MAWA (Mentoring Artists for Women’s Art), grant writing, consulting, compiling a twenty-year chronology of MAWA’s activities for the Culture of Community publication, Winnipeg, Man., 1997–2000. Executive Director: MAWA, Winnipeg, Man., 1992–96. Slide Librarian and School Tours Assistant, Education Department, Winnipeg Art Gallery, Winnipeg, Man., 1989–90. Studio Programs Assistant, Winnipeg Art Gallery, Winnipeg, Man., 1980–88. Public Art Project for St. Vital Park, Winnipeg Arts Council, 2014. RBC Emerging Artist People’s Choice Award, 2013. Manitoba Arts Council: Annual Operating Grants, 2003. Manitoba Arts Council: Annual Operating and Program Assistance Grants, 2002. Manitoba Arts Council: Individual Crafts Grants, 1999. Manitoba Crafts Council: Craftspace Jury, 1998. Manitoba Arts Council: Artists in the Schools Program, 1994. Manitoba Arts Council: Individual Crafts Grant, 1992. Manitoba Arts Council: Visual Art Bank, 1992. Manitoba Arts Council: Short Term Project Grants, 1990. Awards selection jury: Tenth Anniversary, Harbourfront Festival of Craft and Design, Toronto, 1989. College of Fine Arts, University of North Dakota, Grand Forks – Annual Art Students Co-operative Juried Exhibition, 1985. Invited participant in consultation session for the Manitoba Craft Council’s five-year strategic plan, 2015. Board member, Manitoba Craft Council, 2013–present. Programming Consultant and University of Manitoba liaison for the Manitoba Craft Council, 2011–13 – collaborated with the Manitoba Craft Council on hosting Sandra Alfoldy, Craft Historian, NSCAD – public lecture and studio visits, 2011. Member, Programming Committee, Manitoba Craft Council, Winnipeg, Man. (invited curator Paul Greenhalgh to lecture in Winnipeg), 2003–04. Member of Site Gallery artists’ cooperative gallery, Winnipeg, Man., 1999–2000. Member, Crafts Advisory Panel, Manitoba Arts Council, 1992. Winnipeg Art Gallery: Paper Clay Workshops (in conjunction with A Quiet Passage), Winnipeg, Man., 2002. Bridges Program: Edith Regier’s Crossing Communities project for “Women in Conflict with the Law” – Collaborative Tile-making Workshop, Winnipeg, Manitoba, 2001. Winnipeg Art Gallery: Paper Clay Workshop for adults, Winnipeg, Manitoba, 2000. Art City (inner-city drop-in community art studio): Sculptural Light Sconce Workshop for children, Winnipeg, Manitoba, 2000. SAG Conference (Manitoba Association for Art Education): Illuminated Clay and 3-D Tiles conducted for art teachers at the Winnipeg Art Gallery, Winnipeg, Manitoba, 2000. Winnipeg Art Gallery: Paper Clay Workshop for adults, Winnipeg, Manitoba, 1999. General Byng School: Light Sconce Workshop, Winnipeg, Manitoba, 1999. St. John’s-Ravenscourt School: Light Sconce Workshop, Winnipeg, Manitoba, 1998. University of Winnipeg Collegiate: Workshops at the Winnipeg Art Gallery, Winnipeg, Manitoba, 1997–99. Acadia School: Workshops for students in the Enrichment Program, Winnipeg, Man., 1997–99. Winnipeg Art Gallery Quantum Program: Light Sconce Workshop, Winnipeg, Man., 1997. SAG Conference (Manitoba Association for Art Education): Sculptural Ceramic Light Sconce Workshop conducted for art teachers at the Winnipeg Art Gallery, Winnipeg, Man., 1997.